1. Pull husks down to base of cob, exposing silks, without removing husks completely. 2. Remove silks and throw them away. 3. Pull husks back up onto corn, as tight as you can get it. 4. Fill a large bowl, or clean sink with cold water. Place corn cobs in water. Submerge and soak 20 minutes. 5. Heat grill to medium heat. Place cobs, in husks, on the grill. The husks might smoke, or even catch fire. That’s ok.
6. Allow corn to cook about 20 min, turning every 5 min or so. Until kernels feel tender and are easily punctured with a fork. 7. 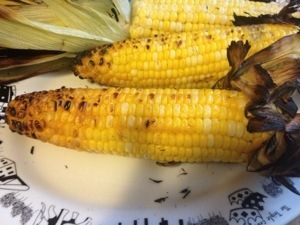 If corn does not have the char marks to your satisfaction, remove husks and place directly on grill to char. 8. Spray cobs with butter, and top with sea salt and pepper. 2. 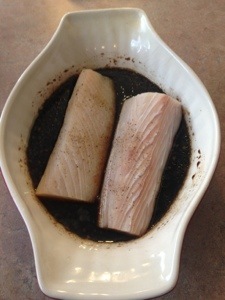 Salt and pepper your mahi fillets, and place them into the dish. Cover, and refrigerate 30 minutes. 3. Heat your grill to medium heat, and grill the fish on each side for about 4-5 min, until fish is cooked through and flaky. 4. In a separate, small pan, heat remaining marinade through until it thickens into a glaze. 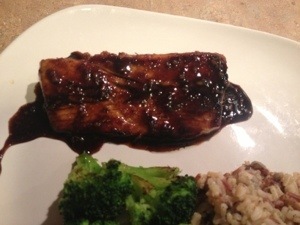 Divide sauce evenly to top each fish fillet. Editors Note: You can use 1 tablespoon of extra virgin olive oil to cook these fillets in a skillet if you prefer. Add 30 Calories per fillet. This is a variation of a recipe I found on pinterest. I liked the concept, but I tweaked the ingredients a bit to fit my taste. In the end, this was really good, and even my kids loved it. 1. Combine the rub ingredients in bowl and mix well. 2. Place chicken breasts in ziplock bag, along with oil. Shake bag to coat chicken with oil. 3. Add “rub” mixture into bag and shake, smoosh, or press seasoning onto chicken breasts until well covered on all sides. 4. 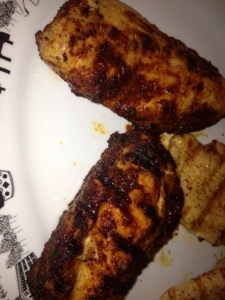 On medium heat, grill chicken for 3-5 minutes on each side, until cooked through. 5. Mix honey and vinegar in a separate bowl. 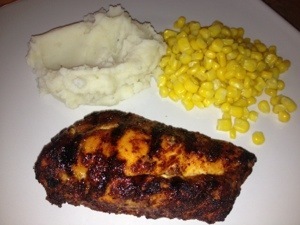 Once chicken is mostly cooked, use a spoon or brush both sides of chicken with honey mixture. Turn and Grill last few minutes, reapplying honey mixture until only about 2 tablespoons of honey remain (save these last 2 tablespoons). Honey mixture will begin to caramelize on the surface of the chicken. 6. Remove chicken from grill, and top with remaining honey mixture before serving. Editors Note: I would not recommend trying to make this in the oven. If you don’t have a grill, maybe just pass on this one. The sugary glaze creates quite a bit of smoke and will likely set your alarm off! 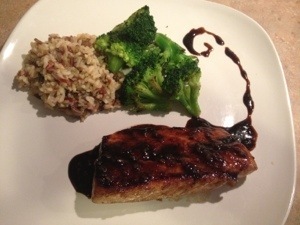 – 1 mahi mahi filet, 4-5 ounces (or fish of your choice). 1. Heat Chicken Stock in a large pan. 2. Add salt, celery and onion. Bring mixture to a boil, then simmer about 5 min. 3. Add potatoes to broth mixture, and cook until potatoes are thawed, about 15 min on low. 4. Cut fish filet into chunks, about 1/2 inch x 1/2 inch. 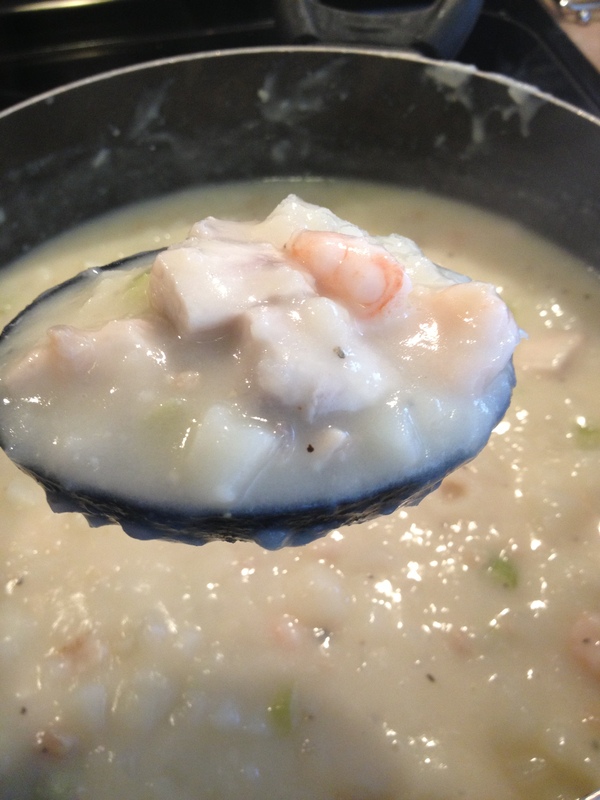 Add fish, shrimp, and clams to pot. Cook on low heat about 3 minutes, until fish is cooked through. 5. In a separate container, mix water with gravy mix packet. Stir Gravy slurry into chicken stock and potatoes. 5. 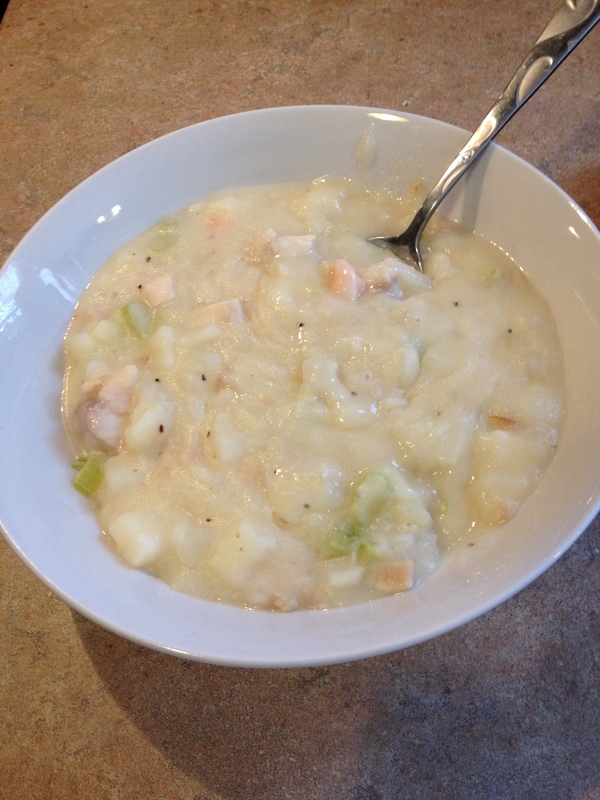 The texture of your chowder will vary greatly here depending on which brand of potatoes you used. If it is too thick, simply add 1/4 cup water at a time until it reaches the desired thickness. I love chicken pot pie. I’m a southern girl. What can I say? But that Crust!!! that cream!!! 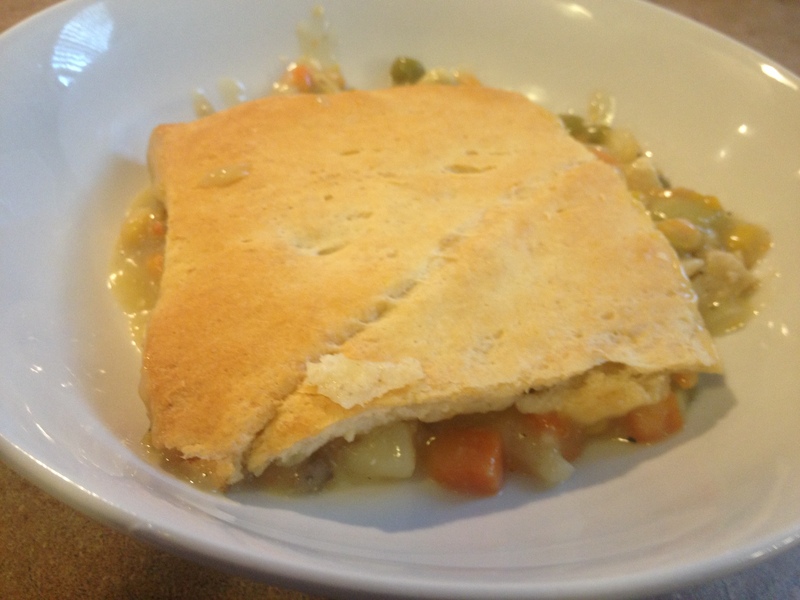 it’s oh-so-fattening, and I decided to post this recipe after picking up a frozen, single serving pot pie at the grocery store this weekend, that had a whopping NINE HUNDRED calories!!! what!? So, here it is…light flaky crust… even if there’s only half as much (crust that is. this recipe won’t leave you hungry). The filling is easy, quick, rich, and super low in calories. In fact, you could eat three servings for less calories than that single serve frozen version! 1. Dice or shred your already cooked chicken, and place it in a large mixing bowl with 2 full cans of soup (undiluted), veggies, garlic, salt, and pepper. 2. Place onions in a microwave safe dish with 1 tsp of water and microwave for 60 seconds. It’s in your best interest not to skip this step… the onions are very strong if you stir them in raw. After cooking, mix in with chicken/veggie mixture. 3. Pour mixture into a 9×13 pan which has been sprayed with nonstick spray. 4. Unroll Crescent rolls across the top of the pan. Press seams together with your fingers to “mend” perforations. 5. 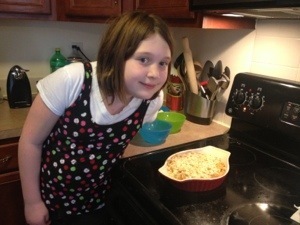 Bake pot pie at 350 for 25 minutes, or until crescent crust is golden brown and cooked through. 6. Allow pot pie to sit for 5-10 min before serving. Seriously. This thing is molten-lava-hot in the middle. Let it sit. Note: you could add a 2nd tube of crescent rolls to use as a bottom crust if you wanted, and it would still only be 412 calories (11 pp) per serving, but i don’t even think it needs it. 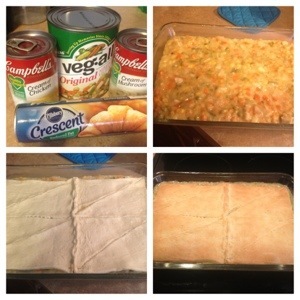 Tuna casserole. Just the mention of this dish sometimes conjures images of elementary school lunch ladies, or that one dish you always had to pretend to like at Grandmas house, right? It’s one of those meals that can vary so dramatically from one cook to another. Does it have a cheesy sauce or a savory sauce? Peas? Eggs? Crackers, breadcrumbs or crushed chips? Taking the first bite was a risk some of us were not-too-thrilled to take. It has a stigma. I get it. 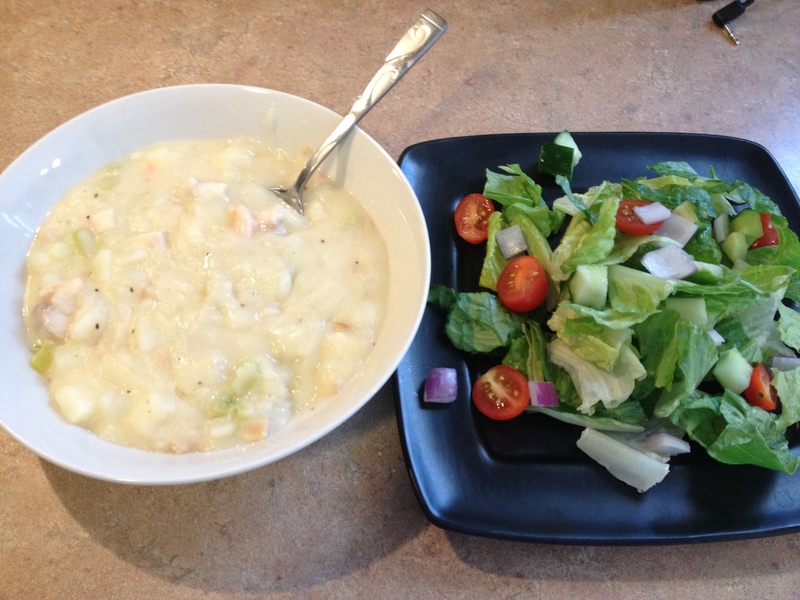 Early on, this was one of my kids favorite meals, and it still is today. We had to tell them it was chicken the first time, but that’s irrelevant. It’s clearly not a gourmet “company’s coming” kind of meal. It’s simple, easy, quick, and kid cliched. I mean, the primary ingredient is a box of powdered Mac and cheese… But, even my pickiest kid loves it, and my husband does too. Also, this is the very first “real” recipe I ever learned to make. My granny taught me when I was about 10. So, this recipe is sort of “where it all started.” You could sneak in peas, broccoli, or spinach if you need to sneak in veggies . Enjoy! 1. Boil macaroni noodles, until they are donee. Drain well and mix with cheese packet and milk. 2. 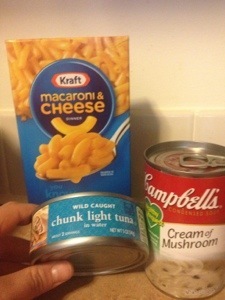 Drain can of Tuna, and mix tuna and soup well with macaroni. 3. Pour into a medium size baking dish (9×9 will work) sprayed with non-stick spray. 4. 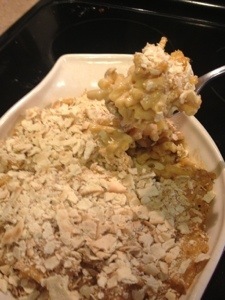 Top with crushed saltines, and bake at 400 for 20 min. This is one of my kids favorite meals. Especially my oldest son. He is a picky eater, but he loves meatballs. I love to make meatballs from scratch, but sometimes I don’t have time. So, I either make large batches and freeze them for later, or sometimes i’ll use the kirkland frozen meatballs from Costco. This recipe is for homemade meatballs, but if you go the costco route, you get 5 meatballs per serving, and add 40 calories. 1. In large bowl combine beef, egg, bread crumbs, onion, salt and pepper, oregano, 3 tbsp parmesan, and garlic. Wash your hands well, and use them to smoosh (technical culinary term) all ingredients together until well mixed. 2. Form into meatballs about 1″ in diameter ( use a cookie scoop) and place on a broiler pan. Bake at 350 degrees for 25-30 minutes until meatballs are no longer pink in center. 3. Boil spaghetti noodles until they reach the desired texture, and drain. Plate 4 equal portions. 5. 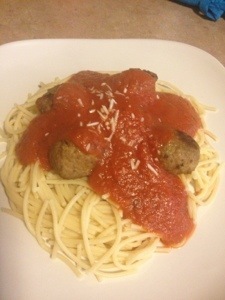 Divide meatballs evenly into 4 servings, and place on top of spaghetti. Top with sauce and 1 tablespoon of cheese.